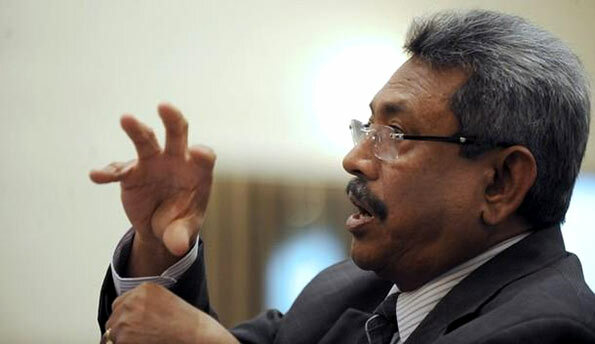 Former Defence Secretary, Gotabhaya Rajapaksa yesterday filed a fundamental rights violation petition, alleging an impending illegal arrest. He has requested the court to restrain the respondent state authorities from resorting to such mala fide practice. He has claimed a likely violation of his personal liberty. The instructing attorney on this petition is Sanath Wijewardene. Among the respondents are Ranil Wickremesinghe, Minister of Policy Planning, Prime Minister and forty four others. The petitioner has requested the court to declare the gazette No. 1901/20, dated February 13, 2015 ultra vires, null and void. The petition will be supported in court on May 13, 2015. Rajapaksa has complained to the court against the gazette which established the Financial Crimes Investigation Division. He wants the court to declare that no steps could be taken in terms of the gazette No. 1901/20, dated February 13, 2015. The petitioner has requested the Court to declare that the respondent state authorities have no right to arrest the petitioner. The independence of the judiciary in the Yahapalanaya era is yet to be demonstrated. Citizens are being remanded for having “misused official vehicles”. Surely, this type of alleged offense does not merit remand. Show me evidence of one official vehicle not being misused in Sri Lanka? They are used by family and others all the time. School children are transported all the time. I see them parked in front of hotels, marketplaces, shopping centers, entertainment centers and even massage parlors and night clubs ! The other day I saw a couple of cows being unloaded to a private residence in a posh suburb from a Jeep with official marking on its side. In fact, remand should only be for alleged criminals where the safety of persons and property are under threat if the alleged criminal is allowed to live in society. Remand is for alleged murderers, rapists, arsonists, child molesters etc. When the case against a person alleged to have committed such an offense, the judicial officer can decide to keep such a person in protective custody to ensure safety of the community. In the Yahapalanaya era, citizens who are alleged to have misused public funds and misused official vehicles are being remanded despite the accused having no control over vehicles or public funds in the present time. This remand business appears to be for the media and public consumption to show the people that a crackdown against corruption in on and that the Yahapalanaya chest-beaters are cracking down on corruption. This stupidity comes at great cost to the amude-wearing taxpayer who is funding deployment of large contingents of policemen and security in the various events including bringing the accused to courts, providing accommodation to the accused in luxury public hospitals.